The ongoing volcanic lava flow is raising many issues for students and their families. The continuously erupting Kilauea volcano on the Big Island is threatening the future of nearby charter schools whose funding from the Hawaii Department of Education is tied to the number of students enrolled, school board members were told Thursday. “We have no idea what we’re still dealing with,” said Sione Thompson, executive director of the Hawaii State Public Charter School Commission. The latest eruption began in early May and has intensified, disrupting the end of the 2017-18 school year — which concluded May 31 — for some schools, including relocated commencement ceremonies, canceled field trips and displaced families. 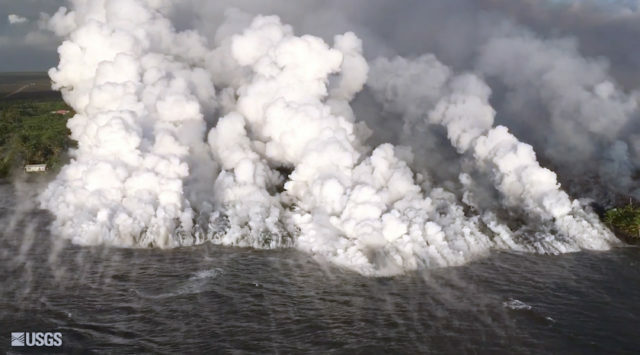 This image taken from video on Monday and provided by the U.S. Geological Survey shows lava from a fissure flowing into the ocean at Kapoho Bay. The ongoing instability caused by the eruption has education officials concerned about students’ well-being. Charter schools are run independently by their own governing boards but receive a roughly $7,000-per-pupil allocation from the DOE. However, they don’t get separate facilities funding or money for emergency relief as with traditional DOE schools. The fewer students enrolled in a charter, the smaller the revenue stream for the school. While a magnitude 6.9 earthquake on May 4 and the continuous lava flow hasn’t actually damaged any school facilities, the flow has so far cut off physical access to one charter in Pahoa — Kua O Ka La Public Charter School — which serves 232 preK-12 students. The final days of the school year were spent at a Boys & Girls Club, and next school year the charter may have to return to that site or a church to hold classes because faculty and families can’t reach the premises due to the lava flow. Concerns over air quality in the region due to vog from ash — wind patterns have pushed vog over to the Kona side, too — and uncertainty about future earthquakes are prompting families to leave the Big Island for the mainland, endangering the livelihoods of other charter schools as well. “It could severely handicap their operating budget … in the first quarter,” Thompson said. The volcano’s impact was a big focus of the school board meeting. Department of Education officials say they are huddling with local officials and coming up with contingency plans for DOE schools before the start of the 2018-19 school year Aug. 6. 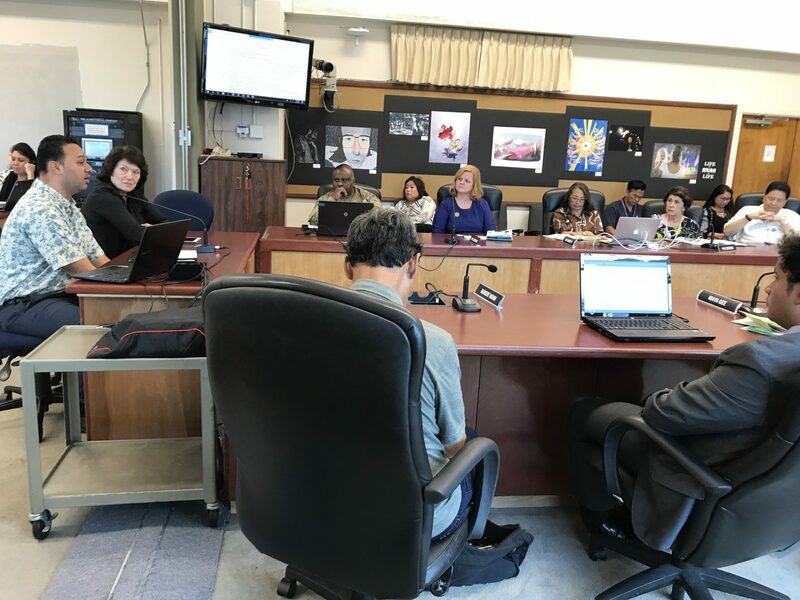 “We will continue to plan with local agencies — making plans for transportation, building services, meal plans,” said Superintendent Christina Kishimoto. An overarching theme was concern over student and family safety, and how school officials could provide support. 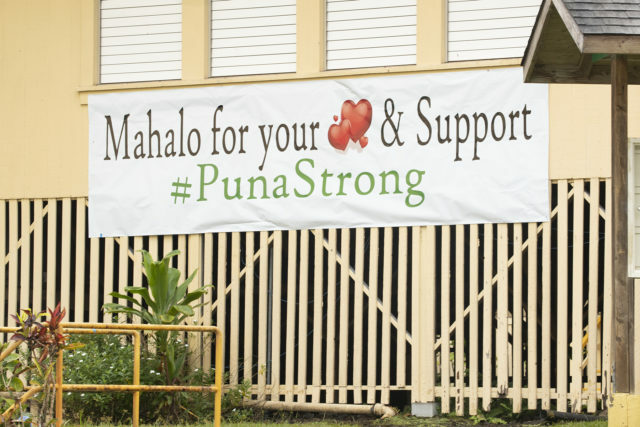 A sign of community support at Pahoa High and Intermediate School last month. “It’s just going to be a devastating concern for these families,” said board member Pat Bergin. Hawaii State Librarian Stacey Aldrich said air-conditioned libraries in the affected area are serving as a sort of refuge for families, not just as a safe haven but also as an information hub since they make daily printouts of the direction of lava flow from the U.S. Geological Survey. “A lot of people come to the library just to get out of the air,” she said. The statewide library system reports to the Board of Education. Aldrich said the system has tapped into resources originally designated for unfilled positions to replace filters in air conditioning systems to preserve air quality in the libraries. She said volcanic ash is a threat to computers, equipment and even book collections. “We believe the schools are better than our homes,” in terms of safety, Farias said. Thompson told the board of a need for mental health services for people traumatized by the instability. Children are not sure if they’ll have a home the next day and teachers are unsure if they’ll have a job to return to next school year, he said. At far left, Sione Thompson, executive director of the Hawaii Public Charter School Commission, and chairwoman Catherine Payne talk about the impact of Big Island volcanic activity on charter schools. School board member Bruce Voss suggested there’s a need for a permanent resource officer on the ground to assist families and provide mental health support for children. “It’s common sense. Those kids need that support,” Voss told Civil Beat after the meeting. The DOE sent six structural engineers to the Big Island to examine some traditional public schools following the May 4 earthquake. The only closures that day were for three Pahoa-area schools, including Pahoa High, Pahoa Elementary and Keonepoko Elementary. No schools have been deemed unsafe or structurally unsound as a result of earthquakes, said Dann Carlson, DOE assistant superintendent for the Office of School Facilities and Support Services.